June 15, 2017 June 15, 2017 - by benign0 - 16 Comments. The battle for Marawi City is degrading into a protracted stalemate between Philippine government troops and Maute terrorists holed up in buildings in the city centre. Though clearly enjoying superior firepower and logistical support, the Philippine military’s progress in retaking Marawi has tapered off. Despite sustaining heavy aerial bombardment, the enemy has proven difficult to root out. The Philippine military says that the militants are using mosques and madrasas as bases for fighting, including for the placement of sniper nests. It has complained that it can’t attack these buildings because they are protected as cultural monuments. Various reports have also indicated that a significant number of civilians remain in areas where fighting is heaviest. The popular view is that these civilians are hostages being held by the enemy for use as human shields. However, there is also speculation making the rounds in social media that some of these civilians may actually be there voluntarily supporting these terrorists. Should Marawi City be bombed to smithereens to prevent any further casualties amongst Filipino soldiers? In short, do we have the appetite to lose more of our boys in this war just to preserve “cultural icons” and save the remaining civilians in the battle zone? These questions become more important as more Filipino soldiers die in this war. When the number of military casualties surpass the number of civilians holed up with the enemy in Marawi, what then? Are “cultural artefacts” and civilian lives of dubious allegiance more important than Filipino soldiers’ lives? These are thorny questions considering the Philippines is a predominantly Roman Catholic country and, as such, one that regards Islamic terrorism with abject horror and a growing contempt that may eventually eat into any further appetite for humanitarian initiatives aimed at the perceived “victims” of this conflict. Even today, Mindanao is but a distant colonial hinterland to the citizens of Imperial Manila where policy is decided and, therefore, where the most important PR battles that may infuence military decisions in the near future will be fought. The peacenik movement that is inclined towards casting doubt on the “wisdom” of military policy and routinely second-guessing the military command consists of various cliques of “influencers” generally associated with the Philippines’ “civil” society, perhaps, albeit arguably, Filipino liberals and their so-called Liberal Party. It is this clique that will likely oppose any decision to grant license to the Army to go harder on Islamic terrorism at the expense of cultural artefacts and remaining civilian lives. It does not help either that members of these cliques, as a matter of personal choice, are virulently opposed to the administration of current Philippine President Rodrigo Duterte. Yet it is important to note that the most important liberal icons in Manila are predominantly-Catholic in nature. The most prominent monument erected to that most celebrated liberal political triumph in recent Philippine history, the 1986 People Power “revolution”, is an enormous statue of the blessed Virgin Mary. At present, there are no Islamic monuments of consequence associated with this “revolution”. Indeed, it could be argued that at the height of the euphoria that immediately followed that “revolution”, Filipinos’ Muslim “brothers” in Mindanao were fully cut out of the Yellow Catholic narrative that went on to rule Filipinos’ minds for three decades. The immediate U S objectives in Luzon in early 1945 was to rescue the POWs in Cabanatuan and the internees at the University of Santo Tomas. Once these were achieved, the Americans turned their attention to Manila and this time, it appeared, avoiding civilian casualties was no longer a concern. In the liberation of the internees, the Japanese custodial force of 150 were allowed to leave under a flag of truce. That was the only time the Americans attempted to negotiate with the enemy. The cost of this military triumph, as the author of the Rappler article points out, was, of course, paid for by Filipino civilian lives and the future of a city that, to this day, struggles to regain a cultural glory it once possessed. These are the same considerations now faced by Filipinos in deciding the fate of Marawi City — and of our fighting men and women over there. More importantly, there is a bigger war at stake, how we, as a people, respond to the advance of the Islamic State into what is perceived to be the weakest link in the overall Southeast Asian effort to defeat them: the Filipino people. Previous Article Criticising Duterte for skipping Independence Day rites is futile: Ph is not truly independent! All this is an empty debate as the difference between WWII and now is that at this time civilian were not protecred by what came after the WWII the Geneva Convention additionals protocols that protect civilian. Tsk tsk, wishing death upon others. That makes YOU the only real criminal around here. The current Geneva Convention is outdated & its NOT very applicable to this post 9/11 era. Right now the terrorists like ISIS, Maute, Al-Qaeda, IRA, etc., etc. are becoming “soldiers” and “freedom fighters” and not ordinary criminals anymore. The time had change. well, well, well, if the so called hostages are protectors of the mautes’ they should be bomb. and if not, launched the urban special forces. if they (mautes’) have a sniper guns, they cannot do close fighting. There is no solution, but to send them to their “martyrdom”…let them enter their “Paradise…and enjoy their “72 virgins”. You will be helping them, by killing them ! These loaded questions are somewhat tantamount (but isn’t really close) to asking a kin to decide whether or not to spend his lifetime savings for the medical requirements of a sickly old dying mother which can probably extend and/or prolong the life but who will, sooner or later, surely and eventually die just the same. It’s a thin line of a choice between the convenience of extending a relationship with the family on one hand and ending the suffering of a kin on the other. Practicality vs. love and affection for a dear one! Such a question though proved easier to answer in the mind of a young soldier (Private First Class Dhan Ryan Bayot of the 51st Infantry Battalion) when he decided to choose death over being rescued in that Marawi conflict. When he’s clearly in the middle of enemy lines and that death was imminent he radioed his coordinates to his commanding officer and gave an unusual request: “Bombahin na lang ninyo ang location ko, sir!”. Selfless determined patriotism/heroism vs. Instinctive personal survival! It’s more easier to decide for oneself than for others. But it takes a real leader who will take the responsibility and blame for such a decision that will affect others! It’s interesting to find out though what exactly is the straight answer of Mr. benignO and other bloggers to this! If it’s a proposal then an answer isn’t necessary! Funny you should use perspective at an individual level to evaluate what is essentially a macro-level issue; i.e., relevant at a collective national level. Do the interests/wellbeing of a couple hundred civilians outweigh the interests of 100 million Filipinos? Clearly, the ISIS threat is one of national consequence that could impact the greater majority of Filipinos. 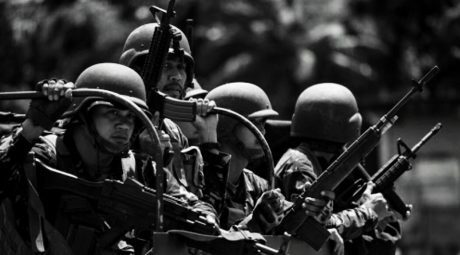 In this regard, the wellbeing of the military overall is at stake here and, as such, raises the question of whether or not staking the Army on the wellbeing of that hundred-odd civlians holed up with ISIS in Marawi City constitutes an optimal deployment of scarce military resources when considering the interests of the entire nation that the Army is supposed to be protecting. There’s where the thinking needs to be had — not around yet another story of otherwise noble heroism that is now being used as fodder for petty partisan bickering. This must be the dilemma, the U.S. was facing, when U.S. President Truman was deciding to drop the Atomic Bomb, on the cities of Hiroshima and Nagasaki in Japan. The Battle of Iwo Jima, Japan was a prelude to what the U.S. forces were facing, before the invasion of Japan… An enemy, who choose death, than surrender. World War II Japanese soldiers, were trained to die for their Emperor Hirohito. There were also “Banzai Charges” of World War II Japanese Infantry Brigades, attacking the U.S. Forces, on frontal assaults, without thoughts of casualties. It was the “charge to death”…it was a fight to death for the World War II Japanese Imperial Army. It is IRONIC , that we are facing an enemy of the same mindset, in this conflict..the Radical Islamic Jihadists.. Radical Islamic Jihadists will fight to death, for a reward of 72 virgins in Paradise. They do not follow any rules of wars or military engagements. Mosques and cultural artifacts, can be sacrificed. The lives of our soldiers , are more worthy than these material things. Civilians caught in the conflicts, whether they want to become “human shields or not”, are just unlucky , to be in the wrong place, at the wrong time. We can rebuild Marawi City, after this conflict. Yeah you’re right, I plead guilty to that. I should use perspective relevant at a collective level. It’s just a random thought. Yes, let’s go for radical amputation. Better to sacrifice a finger, than to lose one’s entire arm. Carpet bombing / pulverizing these last remaining Maute strongholds will send a powerful message to all jihadist wannabes. Mga Pinoy – puro awa mentality kasi e. Think of the greater common good and learn to make painful sacrifices. Then you’ll be a step closer to becoming a great nation. Pain was their body’s way of telling them that they’d pushed themselves to their limits — which was exactly where they were supposed to be. “Should Marawi City be bombed to smithereens to prevent any further casualties amongst Filipino soldiers? If as you sort of suggested this was carried out by the military at the time this article was written, would you see this now as being justifiably right or justifiably wrong, considering that after the Marawi Battle was over, the remaining hostages were saved and were able to come back alive to their respective families? That’s kinda like looking back and saying “I should’ve bought a lottery ticket” after seeing your neighbour win the jackpot, isn’t it?